Like so many visitors that come to the Orlando area Chris and Sheri decided to elope while in town. After contacting Victoria with Intimate Weddings of Orlando and explaining what they were looking for, she immediately told them that she could make their dreams a reality. An elopement in Celebration was the perfect fit. Victoria contacting a fantastic team of vendors to help the couple along. Intimate Weddings of Orlando is exceptional in finding the perfect vendors to fit the needs and the style the couple are looking for. Edmund Rhodes from Rhodes Studios did a marvelous job of suggesting the perfect backdrop for the ceremony. 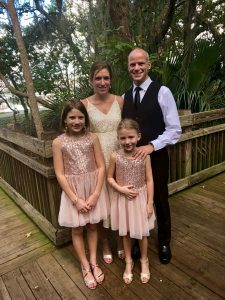 He photographed the couple and their daughters all over the Celebration lakefront and down the nature trails. Rev.Glynn Ferguson from the Orlando team of Sensational Ceremonies, worked with Sheri and Chris to create a beautiful custom ceremony. Their ceremony spoke of love and friendship. Just as these two previous friends were now in love. The ceremony fit them perfectly.